Mother: Sarah, good to see you! Once again we meet. I am loving, loving these visits. Hmmm… I think it is your turn again for a joke. Or even any sort of silliness. I absolutely love silliness. Sarah: Okay, Mother. I’ve been playing around with limerick writing. I memorized one to share with you. Here goes. It’s called The Banana Limerick. I prefer them over national elections. Mother: Oh, Sarah, I love that! You probably didn’t know this but bananas are one of my most favorite designs in all my evolution work. The way they grow hanging in bunches from the banana trees—I love how that worked out. How you two-leggeds hold them and unpeel them in sections. Even the apes do that. It just makes me feel all tickled inside when I watch all of you enjoy them. Plus the fun foods that you cook up with them too. So, so creative! Hmmm … as for national elections. Not my favorite thing at all. At all. All the mud-slinging. There are days when I feel like giving them some real mud-slinging. But I don’t … I don’t. I restrain myself. Okay, Sarah, you can choose a topic today again. What would that be? Sarah: Mother, I would like to know about death and dying. What really happens when you die? Sarah, when you die, you only die to this dimension, this physicality on Earth. When your body gives up the ghost—oh, those poor sad ghosts, never mind them right now—then your soul-body travels to another spiritual dimension and it all starts over again. You still exist in your soul-body then. You are just not on Earth, my glorious planet, anymore. You have moved on to another spiritual plane. It’s a rather beautiful thing, dying, actually. Though most of you two-leggeds are so afraid of it. That makes me so sad. Some of you two-leggeds are only starting to realize there are so many dimensions to the universe. When you die, there are spiritual beings that help you cross over to another dimension. When you get to that gathering place for souls who have just passed on, there is a big party. Loved ones you knew in life greet you and there is a big, big celebration. Of course, time does not mean anything over there, so the celebration lasts as long as it lasts. When the festivities are over, you are guided to the Library of Souls to view your particular book. Some call this the Akashic Records. Your soul has a book for all of the lifetimes that you’ve lived. Everyone has a book. In that book are the records of all you did and said, your kindnesses, your not-so-kind moments. You review your life there and are given the opportunity to consider what you might do better next time. Then, after a period, usually about thirty years or so, you come back. You’re born into another body here. But you’ve never really died, died, as in gone, gone. You see, the Great Mystery is not only a Mystery with a capital “M” but is also the Great Recycler with a capital “R.” Your soul just goes and goes. What is it that you two-leggeds say about an Energizer Bunny? It just keeps on going and going. Though there aren’t any batteries in your soul to give out. Your soul-body can get sort of dented, though, and need fixing. Many times life on the physical plane can be a school of hard knocks, and your soul-body can get damaged when you’ve experienced a lot of trauma. There are gifted healers who walk among you as two-leggeds, and they can help you recover from current or ancient trauma. It’s so lovely when you find a good healer and you feel so spanking beautiful and whole after visiting one of them. It may take a couple of visits though. I love my healers so much, since they help to bring my two-leggeds’ soul-bodies back into a place of good alignment and wholeness. The song that you put out after this alignment is so sweet. It’s actually healing for me too, when this happens. Your song is in closer alignment with my song of love and joy and wholeness. It’s so lovely. So very lovely. It’s good when you two-leggeds can find one of these healers … good for you and good for me. Most of you don’t know this, but it’s actually a huge treat for you as a soul to be living in the physical on this planet. Eating a cherry, tasting that sweetness. Jumping into a cold river or lake and feeling your body tingle all over with aliveness. You can do this only when you are physical on this planet. You can’t do these things when you’re in the spiritual realms. Each of you was born with memories from previous lifetimes embedded in your soul. This is what motivates you to seek out certain hobbies or careers. Perhaps you were a musician beforehand, a gifted one. Child prodigies are children who were extremely gifted at whatever skill or aptitude they had in a previous lifetime. Those soul memories are not lost. Your soul memories can also speak to some of the deepest challenges in your current lifetime. Maybe you died of an abortion in a previous lifetime because the ancient herbal knowledge that could have prevented your pregnancy was hard to access, and you had to seek out an abortion from someone unskilled in a dirty room in a dark alley. Something that traumatic becomes a soul memory in this lifetime, and you might not be so inclined to have a child since that horrific death memory is still there within you. You might even develop health issues over time in your womb-space because of the soul trauma. This is when you could seek out a gifted healer since this type of soul memory is a wound in your soul-body. Or maybe you cut someone’s hand off in a past life and then are born without a hand in this lifetime. That happens. Or you’re terrified to get into a boat or even to swim because you drowned in a past life. So many different experiences that each of you carry into each lifetime. Rather fascinating, actually. If you were completely healed and your soul-bodies were singing as brightly as they could, you would love your physicality and sensuality. That is part of the great gift of being born here in a body. You get to enjoy this body for as long as you are in it. Sometimes you have pains and health issues, and other times you are experiencing the gloriousness of your body with a partner or alone. I know the aches and pains do get a little harder when you get older. It’s part of the beautiful process of being alive. Just as my dolphin children love their physicality and rub all over each other and make love all the time since it is such a joyful act for them, you two-leggeds could be doing this too. You could be enjoying your bodies and the incredible deliciousness of being in one that is capable of making love and tingling all over again and again. Responsibly though. Responsibly. Many of you two-leggeds have been taught that it is a shameful thing to enjoy your bodies. You’ve gotten all warped about this and made the act of bringing yourself to a full bodily wave of tingles wrong. This just baffles me so much. Why would anyone ever want to stop you from enjoying your body, this beautiful body that has been made possible through my work and love, all of my evolution, along with the Great Mystery’s love too? Some of these so-called rules that some of you learn in those buildings where you talk more about God or the Great Mystery than anywhere else really are not helpful. Now, I do think some of the rules taught in those buildings are smart and good. This is true. It is good to learn how to forgive. It is not good to kill other two-leggeds willy-nilly. It’s good to be kind. Not good to steal. But the rules about that one day, the Sabbath Day, being the only holy day in the week … I just don’t get this. Every day is a holy day. Every day is a day to be close to the Creator and me, your Earth Mother. Every day and every moment is a time to consider the Sacredness of your being alive as a soul-body here on my glorious, incredibly fun and delicious planet. I mean we have peaches and chocolate and fresh bananas here. This planet is amazingly delicious! You know, what is it that you two-leggeds call it? The Ten Commandments? 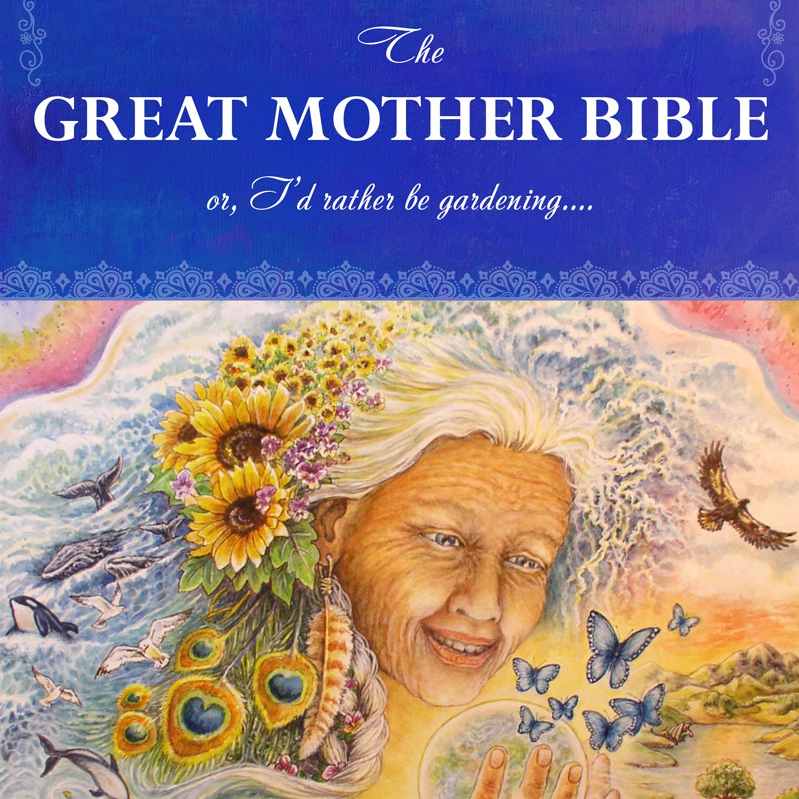 Next time, Sarah, I will give you Earth Mother’s Commandments. Though I’m not sure if it will be ten. I have to give this some thought between now and then. Okay, I’ve got to run. You know it’s still a lovely day. I hope you go for a long walk in the woods after we part here in the Sacred Grove. Love all of you so much!